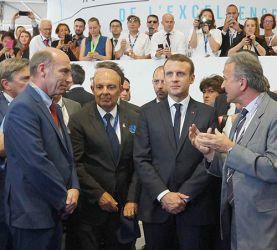 Paris Air Show: Emmanuel Macron visits Finaero’s stand. This morning the Paris Air Show opened its doors. 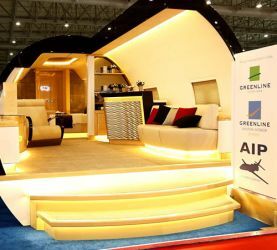 During one week actors of the aviation industry worldwide will meet and discover technological innovations, conclude new agreements as well as meet new prospects. The French President, Emmanuel Macron, inaugurated the show this Monday in presence of a delegation of members of the GIFAS, the French Aerospace Industries Association, including Christophe Cador. After his arrival in an A400M, the delegation greeted the President at the GIFAS Chalet to watch some flight demonstrations. The President then went to the Airbus Chalet where Christophe Cador had the occasion to present him our group and accompany him while visiting our stand as well the plane, where STTS has a booth demonstrating the group’s painting expertise. The President met Caroline Calmettes and Fabien Bordée, painters, David Soulage, technical manager as well as Matthieu Breton, Head of the Paris business unit of STTS. “The visit of the President at our stand is an important sign of recognition of the knowhow of each and everyone of you. I was honored to present it to him in all of our names.” Christophe Cador President and CEO of Finaero.